In 1994, the TransMara County Council (TMCC) was formed in the western part of the reserve, and control was divided between the new council and the existing Narok County Council. In May 2001, the not-for-profit Mara Conservancy took over management of the Mara Triangle. All members of the "Big Five" (lion, leopard, elephant, cape buffalo, and rhinoceros) are found here. The population of black rhinos was fairly numerous until 1960, but it was severely depleted by poaching in the 1970s and early 1980s, dropping to a low of 15 individuals. Numbers have been slowly increasing, but the population was still only up to an estimated 23 in 1999. Hippopotamuses and crocodiles are found in large groups in the Mara and Talek rivers. Hyenas, cheetahs, jackals, and bat-eared foxes can also be found in the reserve. The plains between the Mara River and the Esoit Siria Escarpment are probably the best area for game viewing, in particular regarding lion and cheetah. As in the Serengeti, the wildebeest are the dominant inhabitants of the Maasai Mara, and their numbers are estimated in the millions. Around July of each year, these animals migrate north from the Serengeti plains in search of fresh pasture, and return to the south around October. The Great Migration is one of the most impressive natural events worldwide, involving some 1,300,000 wildebeest, 500,000 Thomson's gazelles, 97,000 Topi, 18,000 elands, and 200,000 zebras. Unlike most other National Parks in Kenya the Maasai Mara National Reserve is not administered by the Kenya Wildlife Service, but by Narok County government. The more visited eastern part of the park is managed by Narok County Council and the western part, known as the Mara Triangle, by the Trans-Mara county council, which is contracting management to the Mara Conservancy, a local nonprofit organization formed by the local Maasai that contains several anti-poaching units. The outer areas known as Maasai Mara Conservation area is administered by the Group Ranch Trusts of the Maasai community who also have their own rangers for patrolling the park area. The wildlife roam freely across both the Reserve and Conservation areas which are a continuous wildlife ecosystem. The Maasai Mara is a major research centre for the spotted hyena. With two field offices in the Mara, the Michigan State University based Kay E. Holekamp Lab studies the behavior and physiology of this predator, as well as doing comparison studies between large predators in the Mara Triangle and their counterparts in the eastern part of the Mara. A flow assessment and trans-boundary river basin management plan between Kenya and Tanzania was completed for the river to sustain the ecosystem and the basic needs of 1 million people who depend on its water. The Mara Predator Project also operates in the Masai Mara, cataloging and monitoring lion populations throughout the region. Concentrating on the northern conservancies where communities coexist with wildlife, the project aims to identify population trends and responses to changes in land management, human settlements, livestock movements and tourism. Sara Blackburn, the project manager, works in partnership with a number of lodges in the region by training guides to identify lions and report sightings. Guests are also encouraged to participate in the project by photographing lions seen on game drives. An online database of individual lions is openly accessible, and features information on project participants and focus areas. Since October 2012, the Mara-Meru Cheetah Project is working in the Mara monitoring cheetah population, estimating population status and dynamics, and evaluating the predator impact and human activity on cheetah behavior and survival. The head of the Project, Elena Chelysheva, was working in 2001-2002 as Assistant Researcher at the Kenya Wildlife Service (KWS) Maasai-Mara Cheetah Conservation Project. At that time, she developed original method of cheetah identification based on visual analysis of the unique spot patterns on front limbs (from toes to shoulder) and hind limbs (from toes to the hip), and spots and rings on the tail. Collected over the years, photographic data allows the project team to trace kinship between generations and build Mara cheetah pedigree. The data collected helps to reveal parental relationship between individuals, survival rate of cubs, cheetah lifespan and personal reproductive history. This work has never been done before and the team is sharing results with the Mara stakeholders and respondents. The ongoing research is a follow-up study, which will compare results with the previous one in terms of cheetah population status and effect of human activity on cheetah behavior and surviving. The project is working in affiliation with Kenya Wildlife Service, Narok and Transmara County Councils and with assistance of Coordinator of Maasai-Mara Cultural Village Tour Association (MMCVTA). The team is cooperating with Mara Hyena Project and working with managers and driver-guides from over 30 different Mara camps and lodges. Rangers and driver/guides are trained in cheetah identification techniques and provided with catalogues of the Mara cheetahs. Game parks are a major source of hard currency for Kenya. Entry fees are currently US$80 for adult non-East African Residents and $30 for children. There are a number of lodges and tented camps for tourists inside the Reserve and the Conservation area borders. The tourists/visitors cater for their own expenses, unless previously arranged by their agencies. Although one third of the whole Maasai Mara, The Mara Triangle has only one lodge within its boundaries (compared to the numerous camps and lodges on the Narok side) and has well maintained, all weather roads. The rangers patrol regularly which means that there is almost no poaching and therefore excellent game viewing. There is also strict control over vehicle numbers around animal sightings, allowing for a better experience when out on a game drive. The BBC Television show titled "Big Cat Diary" was filmed in both the Reserve and Conservation areas of the Maasai Mara. The show followed the lives of the big cats living in the reserve. The show highlighted scenes from the Reserve's Musiara marsh area and the Leopard Gorge, the Fig Tree Ridge areas and the Mara River, separating the Serengeti and the Maasai Mara. A study funded by WWF and conducted by ILRI between 1989 and 2003 monitored hoofed species in the Mara on a monthly basis, and found that losses were as high as 75 percent for giraffes, 80 percent for common warthogs, 76 percent for hartebeest, and 67 percent for impala. The study blames the loss of animals on increased human settlement in and around the reserve. The higher human population density leads to an increased number of livestock grazing in the park and an increase in poaching. The article claims, "The study provides the most detailed evidence to date on the declines in the ungulate (hoofed animals) populations in the Mara and how this phenomenon is linked to the rapid expansion of human populations near the boundaries of the reserve." 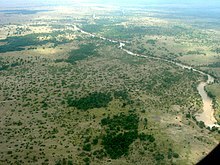 In the Serengeti National Park, a proposed 50-kilometre (31 mi) road from Musoma to Arusha, with tarmac touching the Serengeti, is raising criticism from scientists who say that the road will disrupt the annual migration of the wildebeest, and that this disruption would affect predators such as lions, cheetahs and African wild dogs, as well as the grasslands themselves. According to CCTV "The route is expected to carry 800 vehicles a day, mostly trucks, by 2015 and 3000 vehicles a day an average of one every 30 seconds by 2035, a campaign promise made by Tanzanian President Jackaya Kikwete [sic] in 2005". In late June 2011 the Tanzanian government decided to cancel the Serengeti road plan due to global outcry. ^ a b Protected Planet (2018). "Masai Mara". United Nations Environment World Conservation Monitoring Centre. Retrieved 6 August 2015. ^ "About the Masai Mara National Reserve | National Geographic Lodges". National Geographic Unique Lodges of the World. Retrieved 2017-08-23. ^ "Masai Mara National Reserve". guideforafrica.com. Guide for Africa. Retrieved 23 October 2010. ^ "The Greatest Show on Earth". maratriangle.org. The Mara Conservancy. Archived from the original on 19 October 2010. Retrieved 17 October 2010. ^ "Masai Mara Bird List". maratriangle.org. The Mara Conservancy. Archived from the original on 23 November 2010. Retrieved 19 November 2010. ^ "Research". maratriangle.org. The Mara Conservancy. Archived from the original on 17 October 2010. Retrieved 17 October 2010. ^ "Mara Meru Cheetah Project". marameru.org. Retrieved 2017-12-22. ^ "The Mara Conservancy – Park fees". maratriangle.org. Mara Conservancy. Archived from the original on 8 January 2010. Retrieved 3 November 2009. ^ Ogutu, J. O.; Piepho, H. P.; Dublin, H. T; Bhola, N.; Reid, R. S. (May 2009). "Dynamics of Mara-Serengeti ungulates in relation to land use changes". Journal of Zoology. 278 (1): 1–14. doi:10.1111/j.1469-7998.2008.00536.x. Retrieved 15 October 2010. ^ "Tanzania's Serengeti National Park facing 'collapse' due to highway plans". africanconservation.org. African Conservation Foundation. Archived from the original on 25 October 2010. Retrieved 15 October 2010. ^ Jianfeng, Zhang (1 August 2012). "Highway threatens Serengeti ecosystem in Tanzania". CCTV. Archived from the original on 13 July 2018. Retrieved 4 November 2012. ^ "Serengeti road cancelled". Mongabay Environmental News. 2011-06-23. Retrieved 2018-11-07. Walpole, M; Karanja, GG; Sitati, NW; Leader-Williams (2003). "Wildlife and People: Conflict and Conservation in Masai Mara, Kenya" (PDF). Wildlife and Development Series. London: International Institute for Environment and Development. 14. Archived from the original (PDF) on 2006-01-18. Retrieved 23 October 2010. Wikimedia Commons has media related to Maasai Mara. Wikivoyage has a travel guide for Maasai Mara National Reserve.